With so many different types of rabbit food on the market, choosing the best rabbit foods can be far more difficult than most pet owners think. Instead of buying several types of food in an effort to find the ideal mixture for your beloved pet, consider these five phenomenal brands that each offer their own array of advantages, disadvantages and features. What can rabbits eat and not eat? What fruit can rabbits eat? How long can rabbits go without food? 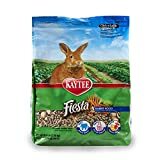 Created for rabbits of all ages, Kaytee Fiesta Rabbit Food is a great alternative to traditional types of rabbit food as it has all of the essential vitamins and minerals that your pet will need to live a healthy and long life. If you’ve been searching for products that will help your bunny to build healthy muscle, detoxify their system and promote a healthier immune system, this may be the right blend for you. Shaped and textured kibble: All of the pieces included in this food mixture are specifically designed with certain shapes and textures that help to promote healthier teeth and gums simply by naturally chewing on the food. Health support: There are plenty of health benefits your rabbit will experience including digestive support with the implementation of both probiotics and prebiotics. Also, with the combination of fruits and vegetables in the formula, bunnies will get the ideal amount of antioxidants to help detoxify their bodies and have a healthier immune system. 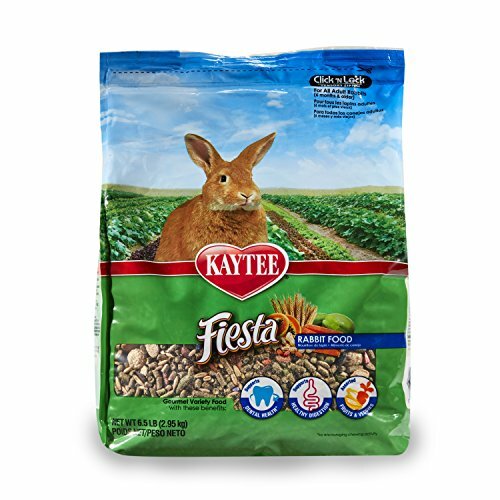 Naturally preserved: Instead of dealing with dangerous and toxic preservatives, you can rest assured that the Kaytee Fiesta Rabbit Food is created using natural preservatives to keep the food as fresh as possible. Rabbits will love it: If you’re worried about transitioning your rabbit from one type of food to another, this is a great option to choose as your pet will absolutely fall in love with the formula. Great as a treat: Instead of using this mixture as an everyday meal for your pets, it can be a great treat once in a while that they will appreciate. Assists with digestive issues: If your rabbit has the tendency to become constipated after eating certain types of food, Kaytee Fiesta Rabbit Food will help to regulate their bowels to avoid any GI issues. Filled with treats: The main problem with this food mixture is that it is a combination of treats and regular food, which may cause your bunny to pick around the healthy elements and only eat the treats. Bad packaging/preservation: Another issue that seems to be common with Kaytee Fiesta Rabbit Food is that there is a collection of bugs and larvae in some packages, which could be as a result of improper packaging or storage. 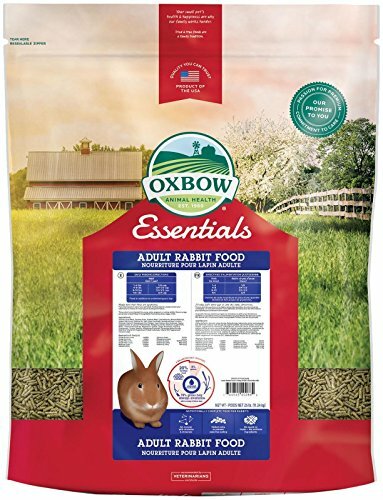 Unlike some other rabbit foods on the market, Oxbow Animal Health Essentials focuses on ingredients that will help make your pet healthier and happier. Although it might not have as many treats as other food mixtures, it focuses primarily on giving your rabbits all of the vitamins and minerals they need to stay strong and live longer. Healthy components: The first thing you’ll notice about this particular blend of food is that it has plenty of healthy ingredients including Timothy hay. Balanced recipe: In an effort to make sure that your rabbits are getting all of the vitamins and minerals they need, this food offers the ideal combination of proteins, fiber, healthy fat and carbohydrates. Barely dusty: If you or your pets have respiratory issues, you’ll be glad to know that this Timothy hay formula is far less dusty than other types of hay food that you can give your bunny. Helps to control weight: Overweight rabbits are more common than you’d think and if you’re dealing with an overweight pet, transitioning them to this food will help them to lose a healthy amount of weight. Due to the fact that Oxbow Animal Health Essentials is such a healthy pet food, there aren’t very many negative things to say about it. However, it is possible that your pets might have digestive issues with this food. It’s important to remember that if you are switching your rabbit from one food to another, you have to slowly transition them to the new food by mixing the old and new food together. Otherwise, your rabbit may have inconsistent bowel movements and general discomfort due to constipation. At first glance, the Small Pet Select Rabbit Food seems like any other food that you could buy from the pet store. However, it’s a food blend that is only available online and was created by two rabbit owners themselves who needed a safe and healthy mixture to feed their pets. There are plenty of interesting features and benefits that you and your bunny will experience once you start feeding them Small Pet Select Rabbit Food. Fiber, vitamins and minerals: Every piece of the rabbit food is designed to make sure that your pet is getting the most nutrition possible with the perfect amounts of vitamins, minerals and fiber. Online exclusive: The fresher your rabbit food is, the better, which is why Small Pet Select Rabbit Food is only available online and made in small batches so it can be shipped directly to customers. Great for picky eaters: If you have a particularly picky bunny, you can guarantee that they will love this food mostly because of its freshness. It doesn’t contain any filler ingredients and is made using premium hay capsules. 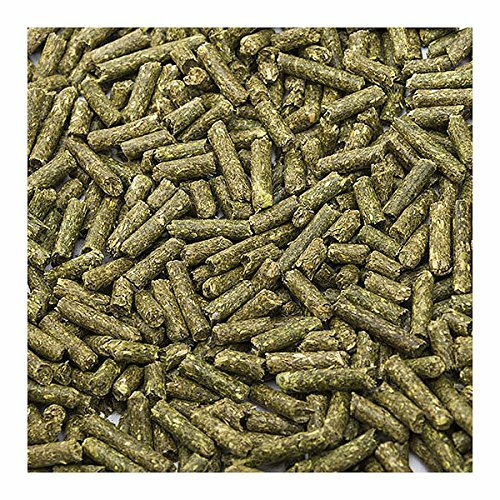 Very fresh: Even if you keep the same bag of pellets for up to five months, you will notice that the pellets are equally as fresh as they were the first day you bought them. Shiny fur and bright eyes: The healthier your rabbit’s diet is, the healthier they will look. Within a month of feeding them Small Pet Select Rabbit Food, you will notice that their coat is shinier and thicker and their eyes are clearer. Includes soy-based ingredients: If you have a rabbit that is particularly sensitive to soy-based ingredients, this isn’t the right mixture for you as it includes soy. Ideal for pets that have particularly sensitive digestive systems and cannot tolerate soy or grains, Sherwood Pet Health Rabbit Food is a phenomenal alternative to low-quality food. With the idea of giving your rabbits as many health benefits as possible, it could be a great choice for giving your pet the nutrients it needs. Balanced nutrition: Designed with every customer’s pet in mind, the nutritious elements in this rabbit food give 100% balanced nutrition. Vitamins and minerals: All of the vitamins in the mixture are all-natural and the minerals are chelated to make them easier for the body to absorb. Nearly completely organic: Although the formula isn’t classified as 100% organic, it is created using wholesome ingredients that your bunny will surely appreciate. Instead of feeding them filler material that would only give them a lot of sugar, they’ll be more likely to eat this food for its healthier ingredients. Reduced waste odor: It can be tough to deal with the odor of urine and excrement from your rabbits on a regular basis, especially when they have been eating low quality food. Within a week, you’ll begin to notice that your rabbit’s waste is far less smelly than before. Healthier and silkier coat: Similar to Small Pet Select Rabbit Food, Sherwood Pet Health Rabbit Food will help your rabbit look better and healthier. Their coat will grow faster and be much softer to the touch than ever before. There aren’t very many negative aspects of this particular rabbit food, though you may experience some difficulties when it comes to getting your rabbit to eat the food. If they are used to different mixtures such as ones with a higher quantity of alfalfa, it’s important that you create a combination of their old and new food until they have completely transitioned to Sherwood Pet Health Rabbit Food. For pet owners that are in the market for a food that will entice your rabbits to eat more often, F.M. 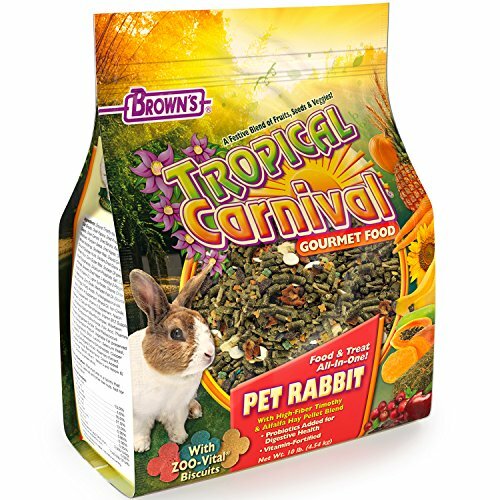 Brown's Tropical Carnival Pet Food could be what you've been looking for. Instead of boring and traditional rabbit pellets, this blend has a mixture of treats and regular food which will surely encourage your rabbit to eat on a healthier schedule. Digestive support: If your rabbit has difficulties with digesting regular types of food, this particular mixture has healthy bacteria and fatty acids to assist with their digestion. Immune support: To help ensure that your rabbit lives the healthiest and longest life possible, the antioxidant-rich ingredients assist with boosting their immune system. Beneficial for oral health: The health of your rabbit’s teeth and gums is essential. The ZOO-Vital biscuits included help promote oral health by naturally chewing. Gives rabbits variety: Aside from the pellets (which your rabbit will most likely not enjoy), there is quite a variety of ingredients in this mixture which can help to encourage your rabbit to eat more. 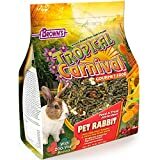 Great as a treat: As there are plenty of treats in the mixture that may not be particularly healthy for your bunny, you won’t want to feed this mix to them on a daily basis. However, it can be a great treat once or twice a week. Selective eating: As the treats in the food mixture are very appealing, your rabbit will have the tendency to focus on eating the less healthy ingredients rather than the hay and healthy ingredients. This can lead to digestive issues such as an excess of excrement or constipation. Pellets are unappealing to picky eaters: If your rabbit is particularly picky, you might find it’s very difficult to feed them with this mixture as it’s far less appetizing than other rabbit foods on the market, such as traditional Timothy hay pellets. Choosing the perfect food for your rabbit is something that can completely change their quality of life. It’s imperative that you find the perfect blend that not only makes them look better on the outside, but also feel better on the inside. There are plenty of things to look out for when you’re choosing the perfect rabbit food to have the healthiest and happiest pet ever. Weight control: Rabbits have the tendency to be obese, especially if they aren’t very active and as such, finding food with some type of weight control is ideal for keeping your pet’s organs healthy. Antioxidants: Similar to humans, rabbits will need a sufficient amount of antioxidants to help push all of the toxins out of their body and to protect their immune system. Organic: Depending on how important organic food is to you, this can make a whole world of difference when it comes to your pet rabbit. Organic foods don’t have any fillers or harmful and unhealthy ingredients. 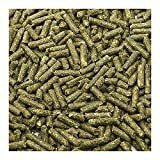 Pellet: Pellets are typically the food of choice for most rabbit owners, especially as they have the tendency to be the closest to organic. Pellets are essentially crushed bits of hay and other healthy ingredients that are easy for rabbits to chew and digest. Kibble: Similar to how dog food is shaped, kibble for rabbits can help to promote the overall health of their gums and teeth. However, it may be dangerous as kibble can be a choking hazard. Hay: Even though pellets are typically filled with hay, it is possible to feed your rabbit the actual hay in its natural form. The best way to make sure you’re giving your rabbit the healthiest food possible is to make sure it’s as fresh as possible. The fresher the food is, the more vitamins and minerals there will be in it and as such, you need to know the ideal way to store your pet food. First and foremost, it is important that you keep all of your hay in a dark and cool place simply because sunlight is only going to make it dry out and discolor the food, which can make it unappealing to your rabbit. However, it is important that you don’t expose the food to any moisture, as mold will form very easily. As another effort to keep the mold away, store all of the food in a plastic container. Even though it might be tempting to order your rabbit food in bulk if your pet doesn’t have a big appetite, it might be preferable to choose a smaller bag to help preserve its freshness. On average, rabbit food loses the majority of its nutrients after two to three months. However, you may be able to freeze some varieties to help keep them fresher for longer. Choosing a smaller bag and buying it on a regular basis helps to make sure that you’re giving your pet the highest quality food without having to worry about it spoiling. Color is a very important thing to think about when it comes to rabbit food because although it might be tempting to buy a very colorful mix, this means that your pet is far more likely to be eating artificial colors which can be damaging to their health. Ideally, the color of their food should be a natural green or yellow, depending on the ingredients in the food mixture. If there’s one thing that everyone knows about rabbits it’s that they love eating foods that taste fresh, such as fresh hay, fresh vegetables and fresh fruits. It’s important to choose mixtures that don’t have any artificial flavors as it may be unappealing to them and unhealthy. Wild rabbits will eat almost any fresh plants in their environment. Their favorite things to munch on include wildflowers, vegetable plants, grasses, weeds, twigs, conifer needles, bark and buds. If you’re responsible for taking care of baby rabbits, it’s important to know that they require a very heavy milk to get all of their nutrients. Ideally, you should give them goat milk or KMR (Kitten Milk Replacer) as it has all of the fats and minerals they’d get from their mother. To help bulk the mixture with more calories, consider adding a tablespoon of sugar-free 100% heavy cream. It’s certainly not recommended to leave your rabbit without food for extended periods of time as it can destroy their digestive system and lead to death. However, rabbits are able to survive without food for up to 24 hours, but ideally, you should never leave them without food for more than 12 hours at a time. 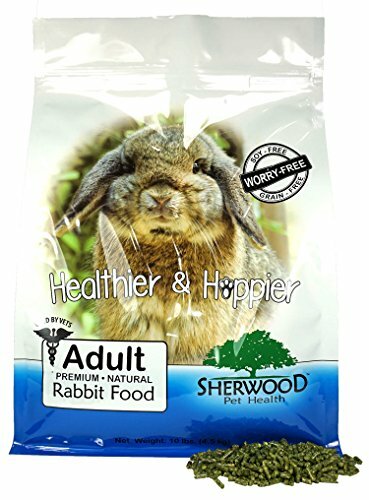 Locally sourced ingredients: The most advantageous aspect of the Sherwood Pet Health Rabbit Food is that all of the ingredients used in the mixture are sourced locally in the United States. Although it’s not a 100% organic formula, it certainly is far healthier than other brands on the market. Assists with digestive issues: If your pet has had difficulties with constipation or if their waste smells particularly pungent, you’ll appreciate that this blend helps to not only eliminate unappealing odors but also helps to keep your rabbit’s bowel movements regular. Healthier coat: If you’ve begun to notice your rabbit’s coat has become particularly dry and brittle, feeding them this food blend will help make their coat healthier, shinier and softer than ever before. The perfect rabbit food is easy to find as long as you take your rabbit’s preferences into account and make sure the food you choose is filled with healthy ingredients. To help with digestive concerns, energy and healthy fat levels, Sherwood Pet Health Rabbit Food is the ideal choice for everyday meals.